Saturday morning, while many of us were still asleep, the legendary Al Davis passed away in his Oakland home at the age of 82. Born on July 4th, 1929 in Brockton, Massachusetts and raised in Flatbush in Brooklyn, New York, Davis was surrounded by football his entire life. Davis was first an offensive line coach at several schools, including USC. In 1960, Davis became an assistant coach for the Los Angeles/ San Diego Chargers of the American Football League. 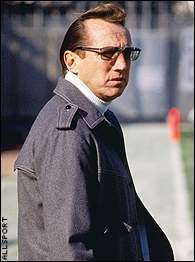 Then in 1962, at the age of 33, Davis became the head coach and the general manager of the Oakland Raiders. In 1966, Davis became the AFL commissioner for just one year, resigning after AFL owners agreed to merge with the NFL despite his disagreement with the plan. Afterwards, Davis would purchase a small share in the Raiders and run the team. In 1972, he would gain control of the team as majority owner and has held onto that position since. Davis would also be the Raiders general manager for the team in addition to being the owner. In 1992, Davis became a member of the Pro Football Hall of Fame. Davis led Oakland to three Super Bowl titles, one AFL Championship, 15 division titles, and a total 21 of playoff appearances. Al Davis will forever be remembered as one of the leaders in innovating the game of football and will forever be a legend.